Walking into Realtor Ann Whalen’s office, I’m greeted by Nimitz – a 4-and-a-half-year-old English cream golden retriever with the kind of chocolate-brown eyes that make you melt like a popsicle left on a Lowcountry dock. He doesn’t bark, dart toward me or jump to make my acquaintance but rather saunters over to the door and gazes out the window to calmly take in the sight of geese congregating by a nearby pond. I can tell by his demeanor he’s enjoying the view. While other dogs may have let out a howl and doused the door with drool in an attempt to make their way out to the feathered flock, he sits and stares – perhaps daydreaming of long rides in the family golf cart. 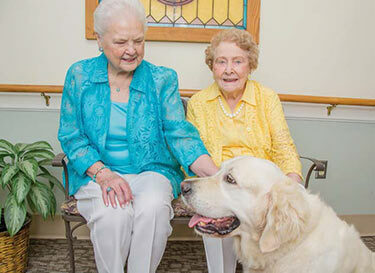 Despite his rebel spirit – apparent from birth – Nimitz has transformed into one of the top therapy dogs in the region. On one occasion, he didn’t even flinch when faced with the weight of a walker on top of his tender tail. Whether he’s visiting folks at the senior center or leaving neighbors in a state of glee, Nimitz’s very presence seems to off er a sense of relief and tranquility. This therapy dog even provides camaraderie for a cat, Meezer, that shares his Awendaw home. This summer, Nimitz will have the opportunity to play alongside some truly exceptional kids at Camp Rise Above – a program held at James Island County Park for those dealing with everything from brain tumors to sickle cell anemia. The camp is broken down into seven sessions of two full days, each catering to a different group of campers with a specific condition. Participants will stretch their creativity with arts and crafts and build strength in the water with paddle boarding sessions. They will also get the opportunity to meet amazing canines like the endearing Nimitz. He already visits hospice every week and brings a bit of cheer to patients and family members during the most stressful times of their lives. “He goes to each room and rests his head on the patient’s bed,” said Whalen. Recently, while visiting with an Alzheimer’s patient, Nimitz’s presence jolted his memory. A veteran, the man became lucid, carried on conversations and even commented on the fact that Nimitz’s namesake was an esteemed fleet admiral who fought in WW II. While therapy dogs bring joy to those struggling with grief, illness or emotional upset, they also are helping kids increase their own literary confidence. We all remember the early days of childhood where sounding out words and reading aloud to a group of our peers could possibly bring on anxiety. What if your reading partner had a shiny coat and a nonjudgmental stance? Therapy dogs make monthly appearances at libraries, such as Mount Pleasant Regional and Edgar Allen Poe on Sullivan’s Island, to participate in reading programs designed to help children excel. 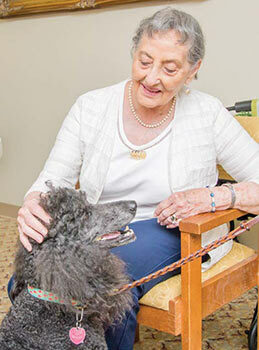 King is the proud owner of two standard poodles, Pete and Holly, that accompany her to hospitals, assisted living facilities and schools all across the Lowcountry. 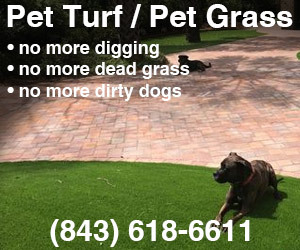 Think your pooch has what it takes to bring smiles to faces throughout the area? King encourages community members to reach out and get involved. From Great Danes to basset hounds, the number of shapes a therapy dog can take is about as varied as the people and ailments they can help.